-THE REVERSE PATTERN (P-R-N-1-2-3) INTERCHANGES THE DRIVE AND LOW (3rd and 1st) positions so you are always shifting away from Neutral and pulling back with the natural force of acceleration. This model is best suited to Competition Applications but can also be used on very high performance street applications where performance and reliability is required. Street operation does require full shifting and careful use of 1st gear. LOW BAND APPLY OPTION: When using the Competition Eliminator Valvebody for street applications, the optional low band apply feature, allows the driver to down shift into low without coming to a near stop and remains in low gear (without the freewheel 1st gear sprag protection of our standard C/E Reverse pattern valvebody) until another gear is selected. The low band apply feature prevents damage to the sprag in street use where spinning on gravel then hitting asphalt under acceleration or lifting in 1st gear then rapidly accelerating again without upshifting may occur in traffic situations. However, due to the inherent shift sequence involved with having the low band applied in 1st gear and needing to release this band and simultaniously apply the intermediate band to obtain 2nd gear, the 1-2 shift with this valvebody option (and all other brands of low band apply valvebodies), is not as quick or clean as our standard Competition Eliminator valvebody. Therefore, the low band apply option is NOT RECOMMENDED for COMPETITION applications. 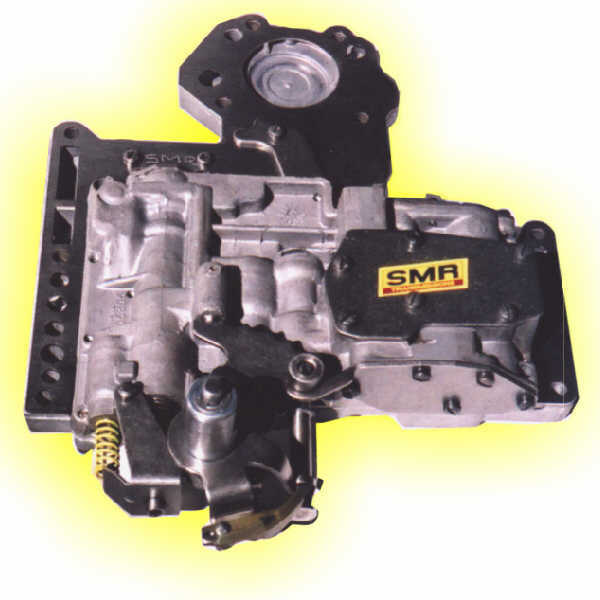 This is a Reverse Manual Valvebody, with the features of the SMR COMPETITION ELIMINATOR valvebody with the addition of a Transbrake feature. The function of the transbrake is to permit the electronic application of Reverse while the transmission is manually applied in Low gear. This results in internally locking the transmission so that input from the engine is not allowed to drive the output shaft. When the transbrake button (which is applying Reverse electonically) is released, the transmission which is Low gear, will instantaneously transfer the power to the output shaft, driveshaft, differential, axels and tires to launch the vehicle. The purpose of such, is to allow the driver to leave at the same r.p.m. on each run resulting in a more consistant reaction time and elapsed time (e.t.) Depending on the application, an improved 60ft. time and e.t. may be obtained. If applied for extended periods, damage to the torque converter and overheating of the transmission may occur. -FIRST GEAR APPLY ONLY SAFETY FEATURE prevents accidental apply of the transbrake in other gears during competition or shut down. -FULL SHIFT PATTERN operates like a non-transbrake manual valvebody when button not activated. DOES NOT REQUIRE TRANSBRAKE APPLY TO BACK UP (REVERSE). This valvebody is best suited to Competition Use Only. It does not require a throttle linkage. Let the experienced technicians at SMR help you determine the valvebody that's best for you! Simply CLICK HERE to provide the information that will assist us in determining your exact requirements.